These multi-purpose, initiating devices cover a wide range of industrial and commercial applications. 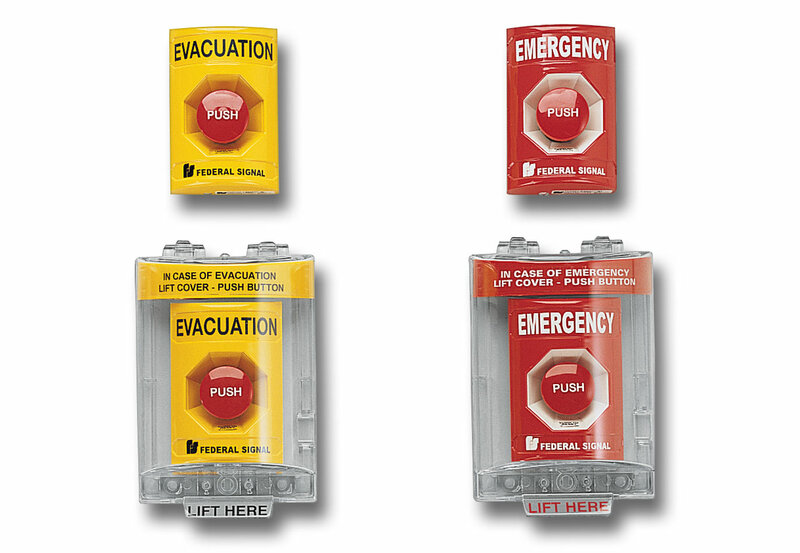 The Federal Signal push-button stations function like a traditional fire alarm “pull station”, providing a simple latching contact closure or momentary contact to activate emergency equipment, audible and visual signals and alarm panels. Each unit is available with or without a tamper-resistant polycarbonate cover.1 Covered units work to protect against physical damage to the station and to prevent false alarms without restricting use in emergency situations. When the cover is lifted to gain access to the alarm, a piercing tone sounds, calling immediate attention to the area. The piezo horn is quiet once the cover is closed. Power to the piezo alarm is provided by a 9 Volt battery (included). The sounder cover mounts easily over the station with four anchor screws. The terminal block provides easy installation and maintenance. Units mount on existing single-gang electrical boxes or 4” x 4” electrical boxes with plaster ring adapters (customer supplied). Contact ratings for the Push Button Stations are 600VAC @ 3 amps and 250VDC @ 1 amp.